I know many people that feel a crying child is distressing to hear, its a natural reaction. You want to help, you want to make it "better," or you just want to bring back the calm before the "storm." For me, as I'm sure it is for others, it's distressing when a child has a hard time stopping. We become flustered, or unsure of what to do, or even become a little scared ourselves. Whether it's the result of a child being frightened, a tantrum, a "boo-boo," or hurt feelings, I let children know that it's okay to cry. Yet my blood pressure can naturally rise after an extended period of crying, no matter how composed I may look or try to be. Children do not always hear us validating their feelings when they are scared, they do not always want to make a choice, and sometimes they can't hear themselves over their own screaming. They are just not ready yet. It is scary to a child when they have BIG emotions they are unsure how to resolve. Sometimes, a child simply needs help re-focusing. My secret focus weapon is breathing. I categorize breathing techniques into two areas; real, and imaginary. All of the objects listed above are real of course, but it's how they are presented. The real objects are things you may most likely have on hand that will help children who need more of a VISUAL. "I'm going to blow this tissue across the table as hard as I can, how far can you blow it?" "I need help making this pinwheel spin, how fast can you make it go?" This can help a child get started on taking those deep breaths needed to calm themselves. 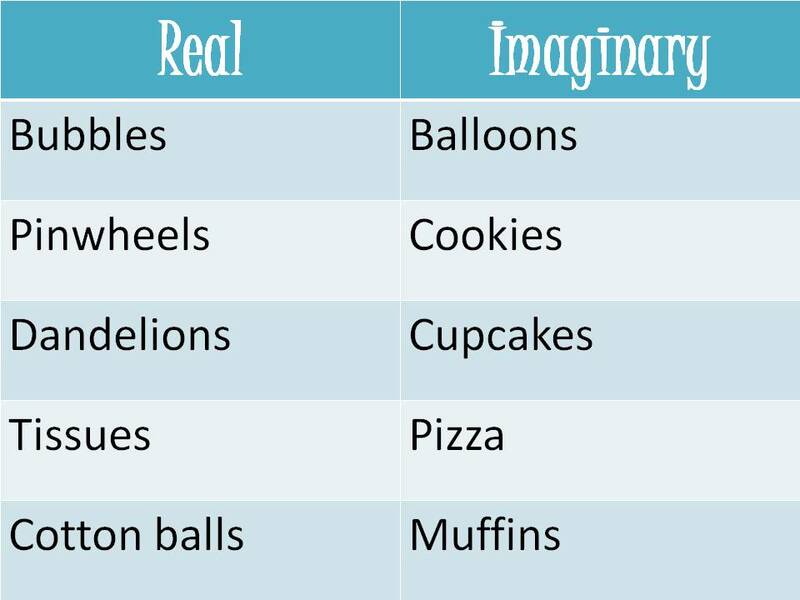 The objects in the imaginary column, are great when you do not have anything on hand, or for a child who loves to PRETEND. "Watch me blow up this red balloon!" Pretend to blow up a balloon, demonstrating deep breaths as you move your hands out to show how big it is. "I'm passing it to you now! Can you catch it, or pop it?" "Now it's your turn to blow up a balloon!" Pretending to pop the imaginary balloons can be a great way for them to de-stress as well. 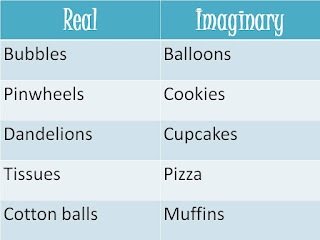 The imaginary food items are examples of favorite foods that can be hot. "Would you like to smell this cookie I baked?" Pretend to hold the object in your hand and breathe in. "Oooo! It's hot! Help me cool it off!" Then blow out as though you are cooling it off. You can proceed to ask the child what kind of cookie he smells, and talk about their favorite kind. These items are just examples, you can use others that may pertain to you and your child's situation. Simply sitting with a child and mimicking these techniques, without saying a word to them, works as well. My own son just doesn't want to hear what I'm saying sometimes. The whole point of using these objects, whether they are real or imaginary, is to show children the appropriate tools available to them, "tools" that can help them regain control of their own bodies. What tools do you use to help children with their emotions, or self-control? I would have never thought about trying this, Heather. It sounds like a great idea though. Thank you! This is great! Wonderful ideas. Pinning it and following you from Share Thread on KBN. Wow! Brilliant! I will DEFINITELY be integrating your ideas at the preschool that I work at, and with my own son! I'm going to be sharing this on my Facebook page (Mama's Little Muse). Thank you! That's a great idea. I'm going to give it a try next time. This is such a great post. I try and help Goblin to regain his breathing if he's had a prolonged period of tears. Usually just breathing with him works but these are really innovative ideas that I can use too. Thanks. I'm sharing this on the Sunday Parenting Party pinterest board. Sometimes we would just use the breathing techniques as a game...even if my son wasn't crying, mostly on car rides because he liked pretending to throw the "balloons" out the window. This is a great technique. My children benefit from those calming bottles and I think some adults could benefit too. Great post. Stopping by from the Parenting Party. Hope to see you at True Aim. Thanks for sharing. I love these ideas. I pinned this back in May and have been using your idea of pretending to blow up the balloon ever since. It's been wonderful. Thank you! I'm sorry I've never commented before. I thought I had. Thanks for linking up to The Sunday Parenting Party. Oh you're welcome Ness! Those techniques are probably my favorite thing I've learned as a parent, it was a lifesaver in the car on long trips home from work. My son't favorite has been the balloon as well, he actually came up with the idea for spiders to some out one day when he popped it so they could "get me." Thanks for the feature! Just popping back again to let you know I've featured this post on my blog today as one of my favourites from last week's Sunday Parenting Party. Thanks again for linking up. Lovely ideas, thank you! It's so true that they need concrete things to focus on, and that the power of distraction (from the tears) is so powerful. So good to teach them tools, both real and imagined, to get beyond the feelings of despair. I have 8 kids and my youngest (age 2) is 5 years younger than my second youngest. I could have used this awesome idea countless times over the last 20 years, but will definitely put it to good use now with my most challenging, yet adorable, little one. Thanks so much for something new for me to use when I need to calm her down! It must have been fate you found it when you needed the most, for your most challenging ;) I hope it helps! Great idea. I've been trying to use breathing techniques learnt from working with anxiety in adults with my daughter to help calm her when upset/overtired etc, but usually she's too in the moment to want to concentrate or listen to what I'm trying to explain. I've tried 'blowing candles out on a cake' before, but hadn't thought of any examples for controlled breathing in, so thanks for the suggestions! What a helpful post. So many times over the years I've encouraged a child to "take a deep breath", but when I think about it, there's a possibility that they didn't understand that concept. Thank you for this! By far my favorite "quick" behavior technique to help children help themselves.